While I’m hot footing my way around Canada and the USA, some of my favourite bloggers have generously offered to share their favourite recipes on the blog. I’m so grateful and so very lucky that these lovely ladies are sharing their recipes and sharing the yum! 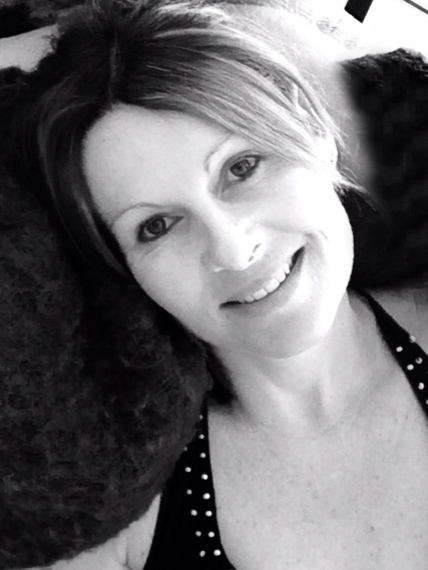 Today, I’m very happy to introduce you to Julie from Gourmet Getaways. Julie’s recipes are mouth wateringly good, her photos are utterly droolworthy and she is the founder of the fabulously yummy Thermomix Kitchen group on Facebook. If you’re the owner of a Thermomix and you are a fan of sharing the love and sharing the recipes, then this is one group you totally want to be part of. Anyhoo, over to Julie, has she got a treat for you this Meatless Monday! Hello lovely readers. Today Sammie has given me the opportunity to share one of my favourite recipes, spinach and cheese naan bread. I have a crazy love of Indian food! I grew up in the small coastal town of Woolgoolga, which has the largest Punjabi Sikh population in Australia. As such I was spoiled with delicious authentic Indian food from a very young age. I developed a love of spicy curries and delicious, buttery flatbreads breads. Quite a few of my friends were born in India and were the first generation of their family to call Australia home. This made sleepovers at my friend’s houses a cultural and taste bud awakening. A dish I always loved to watch being prepared was the Indian flat bread. It amazed me how a ball of dough was transformed so quickly and easily into the softest, most delicious bread ever. The mothers and grandmothers would toast them quickly over a flame and they would magically puff up. Once cooked, they would get a coating of butter and were ready for hungry mouths to eat. 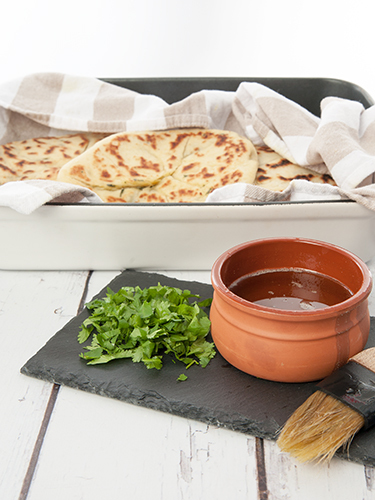 Although naan breads are usually made in the Tandoor Oven, it’s easy to make them at home in a large frying pan. 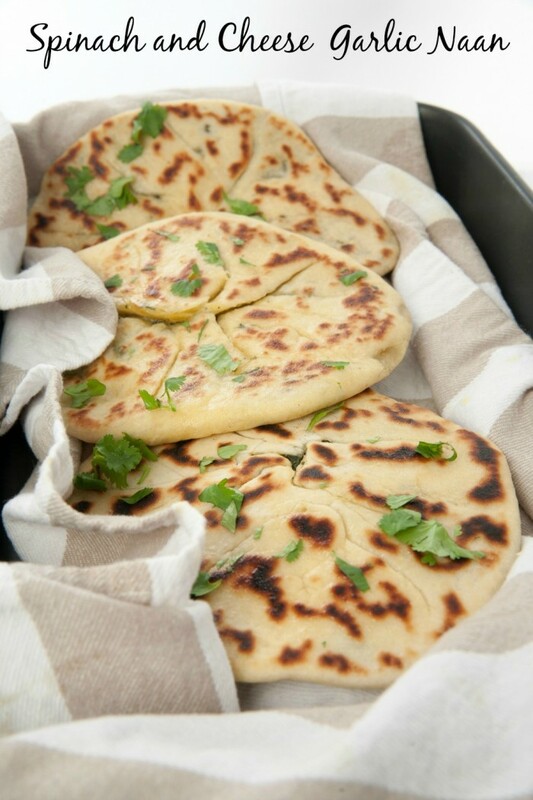 I’m sharing a recipe for Spinach and Cheese Stuffed Naan because these are my family’s favourite. I usually make a double batch so I have leftovers for lunch the next day. The process of getting the filling in the middle is very easy when you know how. I’ve made a 2 minute YouTube video so you can watch the process. Once you’ve made them once you will be a pro! 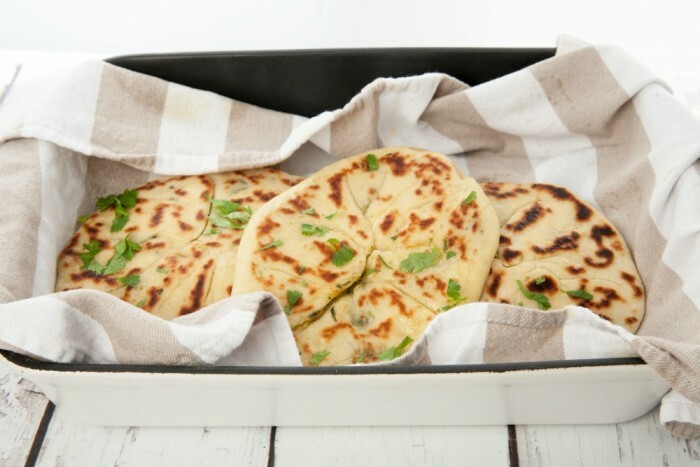 I do hope you try these delicious Spinach and Cheese Naan breads. 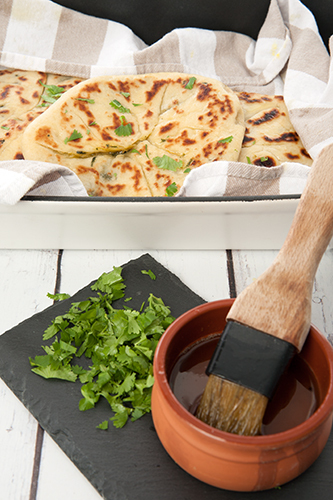 If making a stuffed naans worries you, try making them without the filling for the first time. Once cooked just brush them liberally with the garlic butter. I promise, whether you make garlic naan or spinach and cheese naan, you will be in food heaven. Add garlic to TM bowl. Mince 3 seconds on speed 9. Scrape the garlic down into the TM bowl. Add butter to the garlic. Saute 3 minutes at 100 degrees on speed 2. Reserve in a bowl for later. Add yeast and water to the TM bowl. Combine for 1 minute at 40 degrees on speed 2. Add plain flour, oil, salt to the TM bowl. Kneed for 6 minutes on knead. Remove the dough and allow it to rest for 30 minutes. The dough should be covered and in a warm place so it will proof. Add the garlic, onion and chilli to the TM bowl. Mince 5 seconds on speed 9. Add the minced onion mixture to the pan and fry until translucent. Reduce the heat on the pan so the onion mixture doesn’t burn. Add the spinach to the onion mixture and continue to fry over a low heat until the mixture is quite dry. Remove the filling and allow it to cool completely before adding the cheese. Wipe the pan clean and reserve for later. Flour the bench and divide the dough into 8 round balls. Roll the balls one at a time into a circle about 1/2 – 3/4 cm thick. Place a small handful of the filling in the centre of the circle. Flatten the filling down so that its no more than 1/2 cm high. Turn over the naan and gently roll the dough back to the previous thickness. Heat the reserve pan. Do not add any oil. When the pan is hot dry fry the naan bread. Whilst the first naan is cooking continue to make the next naan bread. Once both sides of the bread have been cooked remove the naan from the heat and place it on a tea towel. Brush both sides of the bread with the reserved garlic butter, sprinkle with coriander if using. Continue cooking the remaining naan bread. The naan bread can be stored in the fridge or frozen and eaten up to a month later. Julie blogs at Gourmet Getaways where she shares luscious recipes with flavours from around the world with friends and followers. Julie and her family love tasting regional cuisines as they travel. Once they return home Julie recreates and shares authentic dishes from their travels. You can find Julie and all of her delicious recipes on Facebook, Instagram, Pinterest, Twitter and of course, her beautiful blog Gourmet Getaways.